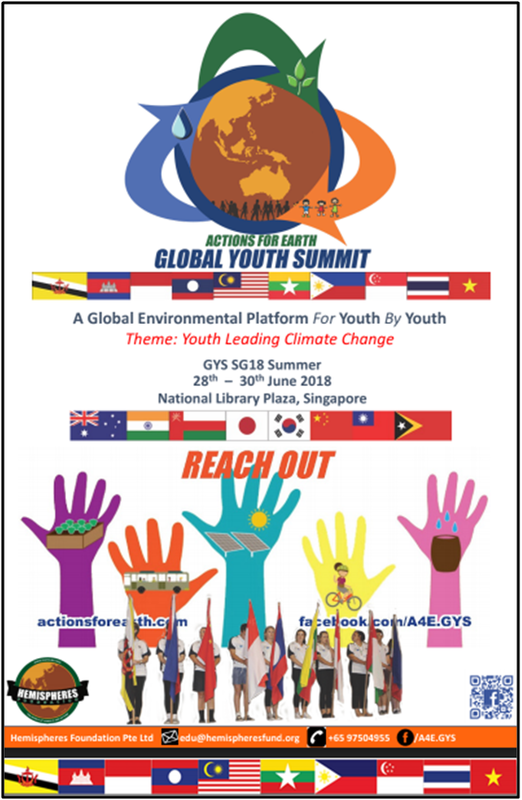 Action for Earth – Global Youth Summit (GYS) is a youth led global platform on sustainable development. It was first organised in Singapore in 2014 and since has been held in Vietnam, Indonesia and Cambodia with over 28,000 participants from over 242 schools in 14 countries. This year, the summer programme held in Singapore from the 28th to the 30th of June, will see participants from Australia, Cambodia, Indonesia, India, Malaysia, Myanmar, Philippines,Taiwan, Thailand, Vietnam and Singapore participating this is exciting event. The students are aged between 11 – 21. The summit offers the unique opportunity to network, discuss and initiate innovation for sustainable solutions. The GYS 2018 is held in Singapore from 28 to 30 Jun 18. The theme of the summit is to Develop Youth to Lead Climate Change. The students have to design and present a Waste Minimisation project. Siam Singapore International School: RVi Academy Bangkok (SSIS) would like to congratulate Miss Marlin Siengwarn (Marlin) and Master Boonworapoj Phungjesada (Jom) for being selected to represent SSIS in this upcoming summit in Singapore. The students have been selected due to their outstanding performance and behaviour in school. During the summit, the students will design a project which they will implement in SSIS when they return. The students will be accompanied by Teacher Kumanan Sadasivam. SSIS wishes Marlin and Jom a safe and enriching trip in Singapore and success at the summit.